Double Diamonds is perhaps the most well known slot available in casinos today. It was established in the late 1980s and still continues to bring in scores of slot fans. The game is so popular creators developed a second diamonds game called Triple Diamonds that is equally popular among casino goers. The two games use a theme based on diamonds. As you can imagine it is these valued rocks that hold the highest payouts, though there are a few other symbols peppering the reels. This includes lucky 7s, BARS, and cherries. They also offer a few different extras, which has added to their appeal. 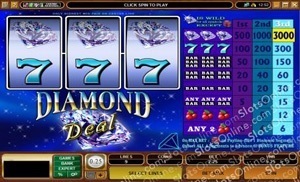 Double Diamonds features a multiplier symbol as well as a 'pay or play' bonus feature, which is similar to the gamble feature in some online slots. It's basically a double or nothing bet in which you can put up your winnings for a chance to win double your payout or nothing at all. The Triple Diamonds game features a second screen bonus game called the Bonus Wheel. A light spins around a wheel filled with different values. Wherever the light stops is your bonus payout. 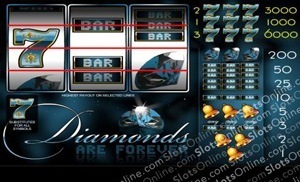 This 3 reel, single payline game definitely pays homage to the original land-based Diamond Slots. Players will attempt to spin in such classic symbols as diamond BARS, lucky 7s, and cherries. The game offers multiplier symbols that will double payouts when they appear in winning combinations. It also offers a top payout of 3,000 coins. Check out our Diamond Mine Deluxe review or start playing at Cherry Red Casino. 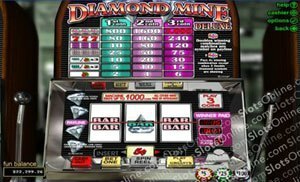 Similar to Diamond Mine Deluxe, this is a 3 reel, single payline game that offers players the chance to spin in big wins with diamonds, BARS, lucky 7s, and cherries. The game offers a wild symbol that will replace all others as well as a bonus round in which players can win plenty in extra payouts. The game holds a top payout worth 3,000 coins. Check out our Diamond Deal review or start playing at All Slots Casino. This 3 reel online slot is a little different in that it offers players three paylines instead of one. This is somewhat different, but it gives players more chances to win. Diamonds are Forever also offers such symbols as lucky 7s, BARS, and bells. The game carries a top payout worth 6,000 coins. Check out our Diamonds are Forever review or start playing at Rome Casino.